A young woman with copper hair, thick-framed glasses and a bright blue trench coat sneaks around the edges of shadowy mansion. She's searching for clues -- something about a nefarious man, a ghost ship and science experiments gone awry. Behind a bookcase, shrouded in darkness, lies a secret surveillance lair lit up with live feeds from all around a small, mysterious town. Suddenly, one of the screens flips to present a tiny, trench-coated silhouette in front of a bank of surveillance equipment, and a hulking figure creeping up from behind. 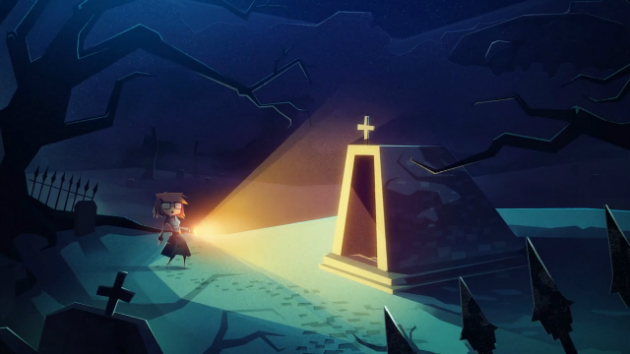 This is the free, playable demo for Jenny LeClue, a dark-humor adventure game inspired by choose-your-own adventure stories with roots in sci-fi, horror and mystery. It's out now for iOS, PC, Mac and Linux, and according to creator Joe Russ, it's going over extremely well with early players, some of whom assuredly backed the game's $105,800 Kickstarter. "It's very humbling," Russ says. "We are also getting useful feedback about things we can improve, like some of the controls. And it's great to see that we are successfully communicating the tone and atmosphere of Jenny LeClue's world. People are getting a glimpse at her character, the way she thinks and the choices she makes." 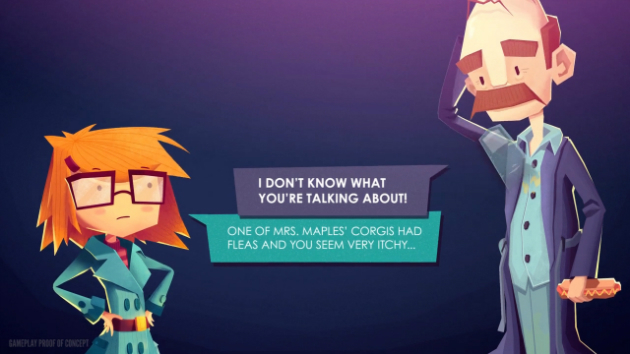 Jenny LeClue is a coming-of-age, mystery-adventure game with a few different layers: First, there's Jenny. She's a plucky, intelligent and fearless investigator who gets sucked into the most important case of her young career when her mother is accused of murder. Second, there's the narrator-type character, Arthur K. Finklestein. Arthur is the author of the Jenny LeClue choose-your-own-adventure novels, so you're technically playing as a fictional character inside of a fictional series of books. Arthur and Jenny play off of each other during the game: Sometimes Arthur "writes" one thing and players can choose to do the opposite, altering the story and providing plenty of opportunities for lighthearted humor. "We are interested in exploring the idea of authorship, allowing the player to influence the author, who then in turn influences Jenny's world," Russ says. "The community of players will also have a chance to effect the story as we write future content. A meta-narrative with a kind of crazy infinite loop of influence." Jenny may have just been to a crime scene where a victim's watch was stolen. During a conversation with one of the witnesses, you notice they have a watch, similar to what was described at the crime scene. Upon closer examination, you realize there's a little bit of blood on the edge of the watch. Suddenly this person seems a lot more interesting and possibly more than just a witness! In addition, you've opened new avenues of dialogue and inquiry. People have started doing "Let's Play" videos of the playable teaser and even streaming it on Twitch, Russ happily notes. Since the game's success on Kickstarter -- the goal was $65,000 and it received almost double -- Russ and his studio, Mografi, have focused on interacting with the community and involving them in Jenny LeClue's development. "After the campaign, we wanted to work smart, and the playable teaser gave us a way to test our concepts in a very tangible way," Russ says. "One big piece of advice I hear developers repeat: 'Test early and test often.' This was our way of testing early. It's been a great way for us to build the foundation for the main game and communicate the kind of story world we have conceptualized. It's like building a small boat and making sure it's sea-worthy before attempting to build a yacht." One potential change that Russ is kicking around is splitting the game into two episodes, rather than the originally planned three. "This is mainly due to the fact that we really really want to make the complete overarching story, and we want to best ensure we have the resources to do that," he says. The first episode of Jenny LeClue is due to hit PC, Mac, Linux, iOS and Android in early 2016 for $15. For now, check out the playable teaser here. "I want players to walk away with a really solid feeling for the kind of dark and whimsical atmosphere that we want to convey," Russ says. "We tried to focus a lot on creepiness in the playable teaser, and a sense of danger -- Jenny is breaking into someone's house after all."